Durian is a fruit of the tree. A durian probably derived from the Malay term, that is from word of thorns that was given the suffix-an. This word is mainly used to describe sharp barbed fruit skin. Durian itself comes from the forests of Malaysia, Sumatra, and Kalimantan, which is a wild plant. Durian is a fruit of the tree. A durian probably derived from the Malay term, that is from word of thorns that was given the suffix-an. This word is mainly used to describe sharp barbed fruit skin. 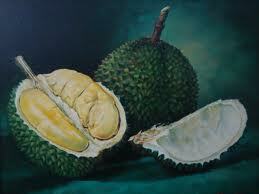 Durian itself comes from the forests of Malaysia, Sumatra, and Kalimantan, which is a wild plant. Westward spread of durian is to Thailand, Burma, India, and Pakistan. In Asia, this fruit has been known since the 7th century AD Based on historical records, another name durian is Duren (Java, Gayo), Duriang (Manado), Dulian (Toraja), and Rulen (East Seram). Durian fruit has the benefits of natural mineral that is easily digested by our bodies. Durian also contains phosphorus and iron that is 10 times more than bananas (mas, Ambon, and beranga). But because of the high mineral content, especially calcium and iron, the durian can be the cause of the problem on large bowel movement. For those who have a history of high blood pressure, are advised not to consume this fruit in conjunction with alcohol because it can cause a stroke. In addition, it is advisable to drink plenty of water before and after eating durian to avoid dehydration.